France and Japan want to recover pieces of a Martian Moon and bring them back to Earth, the head of France's National Centre for Space Studies (CNES) said Thursday. The Martian Moons Exploration project would launch a probe in 2024 destined for Phobos, the largest and closest of two moons circling the Red Planet. Paris and Tokyo signed a preliminary agreement on Monday, and will make a final decision before the end of the year, CNES president Jean-Yves Le Gall told AFP. "It's a very important mission because—besides the Moon—it would be the first time samples from the satellite of a planet would be brought back to Earth," he said by phone. 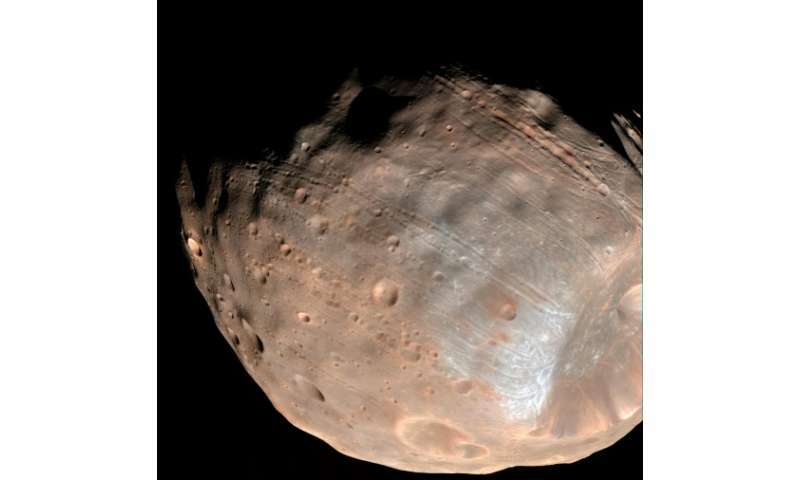 Slightly egg-shaped, Phobos is 27 kilometres (17 miles) in diametre from end-to-end. Analysing its composition would solve a long-standing question as to its origins. One theory holds that the oblong moon is an asteroid captured by the gravitational pull of Mars. Another says that it is left-over matter from the Red Planet's creation event. Landing on Phobos will also provide another vantage point for observing Mars, only 6,000 kilometres (3,700 miles) distant. Getting there poses fewer challenges that landing on Mars, a graveyard for several failed missions. "It should be twice as easy because the probe will not have to go through the Martian atmosphere," Le Gall said. The Japanese partner for the project is the Japan Aerospace Exploration Agency. Phobos—closer to its planet than any other moon in the solar system—is approaching Mars by about 2 metres (6.5 feet) every century. Scientists expect the moon to be pulled apart in 30 to 50 million years. In 2011, a Phobos-bound probe launched by Russia—it's first interplanetary mission in 15 years—failed, with pieces falling into the Pacific two months later. In 2020, the joint Europe-Russia ExoMars mission will lauch a rover tasked with finding traces of Martian life, past or present. NASA's Curiosity rover has been criss-crossing the planet for more than three years. The American agency has plans for a manned trip in the next 10-15 years, with a similar project also being pursued by US billionaire Elon Musk. I'd rather them explore the moons of Saturn or Jupiter for life. Everything that tries to get some real (useful) data on those particular moons, seems to fail. Odd, that. We have had many spacecraft explore the moons of Saturn and Jupiter. The one lander we tried worked. Looks like soon there will be no place to hide on Mars. It seems to be pretty well covered, with more to come. I am more interested in the moons of Jupiter and Saturn. Will we find evidence of life? Phobos is a great target for exploration! I for one wish this French/Japanese effort much better luck than the Russians had going there. There may be many useful raw materials there, but if water ice could be mined on Phobos and/or Deimos, then billions of dollars could potentially be saved in crewed exploration of Mars by refueling in Mars orbit for the return trip. As Elon Musk pointed out, even if all the astronauts/colonists were to stay on Mars, we still need to bring the spacecraft back to reuse it. Better still, refueling at Mars might enable opposition class spacecraft that are fast enough to travel to Mars and back on the same Mars opposition. Such a spacecraft would allow us to drop off a fresh crew on Mars, and bring back the previous one on the same trip. This could potentially give us a permanent presence on Mars with a single interplanetary spacecraft. Weird, the last three sentences have nothing to do with the topic of this article. News algorithm?